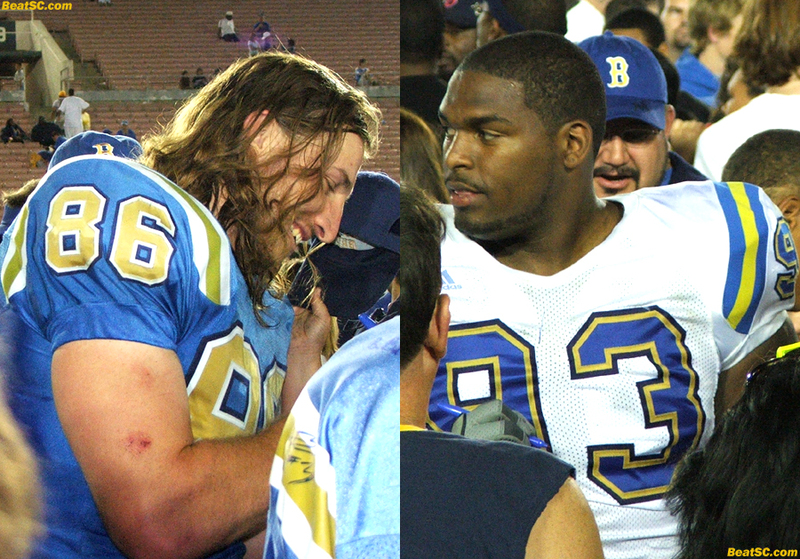 The 2008 UCLA Football team is off to a Smart Start, because when it comes to picking leaders, they’re grrreat! On Friday, the players themselves voted in tough guys Logan Paulsen and Brigham Harwell as Team Captains. Head Coach Rick Neuheisel will appoint additional Captains on a game-by-game basis, but barring injury, Tight End Paulsen will be an Offensive Captian, and Defensive Tackle Harwell will be a Defensive Captain, for the whole season. The keys words there are “barring injury,” which probably explain why Ben Olson apparently didn’t rock the vote, over the more durable Paulsen and Harwell. Since Olson’s the starting Quarterback, who happens to be older and more experienced than everyone else on the team, you would think that he would be the logical choice for Captain. But do you really want a Captain on crutches, cheering you on from the sidelines? Not to be harsh, but based on the last four years, it’s not that far-fetched to think that Olson might not play in all 12 games. As long as Neuheisel plans on adding Weekly Captains, Ben can still be a designated Leader, one game at a time. And not to go all TMZ or anything, but there IS some gossip that Olson’s aloof and somewhat elitist attiude is what kept him from receiving votes, NOT his being injury-prone. When the Players vote, it becomes less important who would be the Best at “Captaining,” and instead turns into more of a Popularity Contest. And it’s ONLY RUMOR, but according to the Beat Writers, Olson isn’t about to win any of those. Pat Cowan might have, but now his playing days are over. It will be ON OLSON to win over those who chose Cowan over Olson when the two competing QB’s were dividing loyalties during their QB Controversy. Hopefully, with a neu regime in place, and a whole new, positive attitude sweeping the whole Program, all of these personality and chemistry issues will be a thing of the past. And besides — There is no cure for friction like WINNING. And speaking of Captains, the Dance Team Captain this year will be the lovely Kara (btw, the previous holder of that position did not seek another term). "CAPTAINS CRUNCH" was published on June 15th, 2008 and is listed in Blue & Gold News, UCLA/usc/Cheerleader Photos, UCLA/usc/Sports Photos. Congrats to Logan and Brigham. Here’s to them leading the team by example and on to victory. As for Olson being aloof and elitist, it might be more like there’s a maturity gap between him and the many of the players. There’s a big difference being in college, 25ish and married than 19ish and single. Besides football, Ben has other things going on in his life than many of the other players. Getting hurt hasn’t helped his cause either. I’d love for Ben have a great season but more importantly I want whomever the QB is to just get the job done: just move the chains. Speaking of Capt’n Crunch, since it’s Father’s Day today, I think I might go out and get a box. Once a year I need to treat myself. He’s always been a class act. I went to high school with him and subsequently played ball with him and against Ben Olson. I hope the leadership qualities will show through and will help the Bruins stay strong both physically and mentally in the upcoming season. Good luck fellas. Ooooh weeeee. Congrats to Logan, Big Brigs, and Kara on being captains this year.